The Mega Man Network has done some articles recently that show they aren’t afraid ask the tough questions and probe the deepest darkest secrets of the Mega Man franchise. 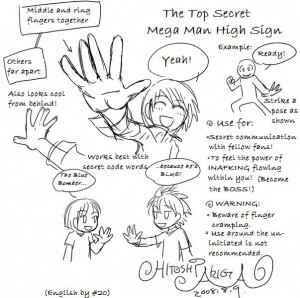 This is mostly a response to this one in particular, which also did not escape the attention of manga artist Hitoshi Ariga. In 2008 he also felt compelled to put up a blog post dealing with this controversial issue, which I would like to present henceforth, dubbed for an English audience. Proceed once your mind is clear, and enter into the inner sanctums of knowledge. Get the word out. The people must know. 1 Comment to "Trekkies have one… shouldn’t Mega Man?"